Engineered to withstand temperatures up to 200 degrees Fahrenheit, PEX (cross-linked polyethylene) is a highly durable and flexible plasticized tubing. Due to its high temperature rating, PEX tubing is well suited to most indoor plumbing applications, including connecting hot water heating fixtures. Unlike PVC piping, which is joined with epoxy, PEX tubing is connected with mechanical fittings, making it an ideal replacement conduit for baseboard hot water heating systems. PEX tubing was designed for hot water plumbing applications. Turn off the power to the heating system at the water supply heater or service panel. Twist the water supply valve closed with your hand. Place a large bucket under the drain valve at the water supply heater and open the system drain valve, with a wrench if necessary, and drain the system of water. 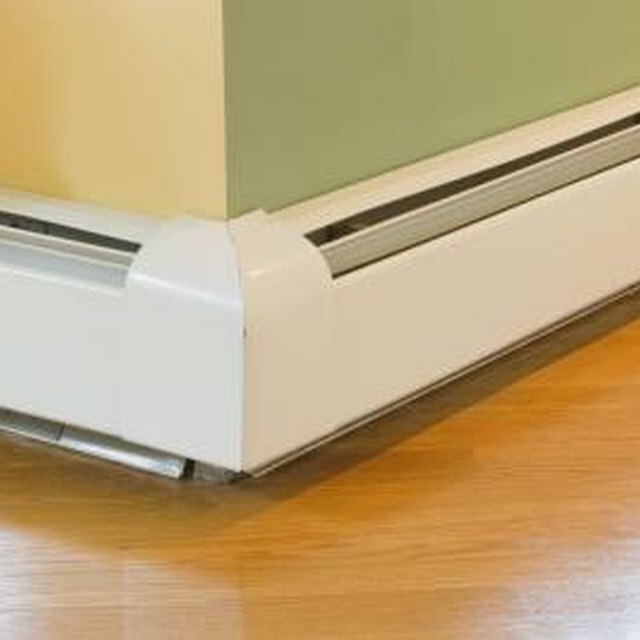 Remove the baseboards from the wall, if necessary, to access the water supply pipes. Insert the cutoff blade of an oscillating tool behind the baseboards to cut the nails attaching the baseboard to the walls. Place an absorbent cloth under the pipe fittings, to absorb any water remaining in the lines, and disconnect the pipe fittings with a wrench. Remove the disconnected pipes from the system. Run a single length of PEX tubing from the water supply heater to the baseboard registers. Route the tubing along the same path as the old pipes and cut the PEX tubing with a utility knife. Attach a PEX-threaded adapter to each end of the PEX tubing. Crimp the PEX end of the adapters to the tubing with a PEX crimping tool. Attach the threaded end of the adapters to the baseboard heater and the water supply manifold with a wrench. Turn on the power to the water supply heater. Close the drain valve and reopen the water supply valve to pressurize the system. Check all fittings for leaks and tighten the fittings with the crimp tool or wrench if necessary. Turn up the thermostat until the heating system activates. Allow the system to reach operating temperature and check the fittings again for leaks. Reattach the baseboards to the wall with a hammer and nails. Repaint the baseboards if necessary. PEX tubing is not suited to older boiler systems where water temperature exceeds 200 degrees Fahrenheit.